Sautéed mushrooms are a fantastic side dish. 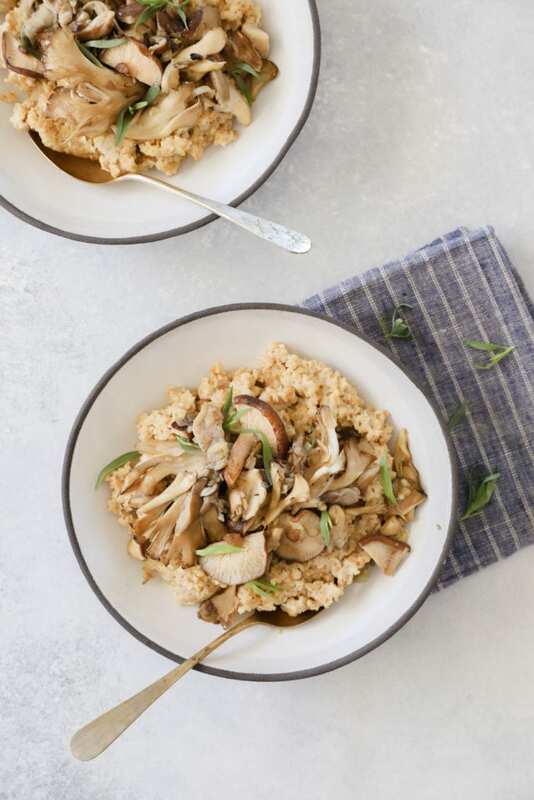 When combined with our hearty One Degree Organics Steel Cut Oats plus the cheesy flavor of nutritional yeast and classic combo of shallot, herbs, and garlic, your favorite mushroom blend will be transformed into a robust main dish that can hold its own on the dinner table. Bring liquids to a boil in a medium pot. Add oats and nutritional yeast and cover, reducing heat to low. Cook until tender, 20–25 minutes, stirring occasionally. While oats are cooking clean the mushrooms and cut any large pieces. Sauté shallot and garlic over medium low heat until fragrant and just beginning to brown. Add mushrooms and cook until just tender. Add tarragon, mix well and let sit for 2 minutes. Divide the oatmeal between serving dishes and top with mushroom mixture. Garnish with additional tarragon, salt and pepper to taste.